Tallahassee, FL—As the United States of America does everything necessary to keep all Americans safe from terrorist—on the homeland and abroad—there are people who insist on keeping Florida families from prospering, from moving into the 21st century. Recently, two Florida corrections officers who are members of the Klu Klux Klan (KKK) were arrested for plotting to murder a Black inmate. In 2011, in order to charge 17-year-old, DeShon Thomas, a Black college student, with two counts of 1st Degree Murder, Second Judicial Circuit Assistant State Attorney/Prosecutor Jack Campbell approved a Summary of Offense for Two Counts of 1st Degree Murder and Probable Cause Affidavit drafted by one of his wealthy, close friends—Don Odham—identifying Mr. Odham as a Leon County Sheriff’s Detective. Assistant State Attorney/Prosecutor Jack Campbell then got a county judge to approve the probable cause and issue an arrest warrant for Thomas. In addition, Assistant State Attorney/Prosecutor Jack Campbell filed the probable cause affidavit and other notarized legal documents with the Leon County Clerk of Courts identifying Mr. Odham as a Leon County Sheriff’s Detective. The murders, which had taken place in the jurisdiction of the Leon County Sheriff’s Office—were being investigated by Prosecutor Jack Campbell’s dad—Leon County Sheriff Larry Campbell, also a friend of Mr. Odham’s. Since Thomas, who is INNOCENT—pled NOT GUILTY—the Campbell’s along with their friend, Don Odham, recruited many of those within the local judicial system to ensure Thomas’ conviction. This is what most people would view as EXTREMISM! To act in such an EXTREME manner, as those two employees with the Florida Department of Corrections and the Campbell’s along with all their recruits—is a prime example of how CONNIVING and SELFISH people in positions of authority abuse others—including those whom they work with every day. The Department of Corrections employees and the Campbell’s breathed HATE. When a person breath HATE—their acts and their thoughts become EXTREME! To want and plot to KILL a man is EXTREME. To ask certified law enforcement officers to VIOLATE LAWS is EXTREME! No White man already in a position of authority should EVER allow a Black man or a Black child to consume such an EXTREME amount of their lives. Today, not much has changed in the life of the inmate in which the two corrections officers plotted to kill. However, the lives of the two corrections officers and their families’ lives have changed forever. As for Thomas, who was sentenced to Two Life Sentences plus 30 years, there’s nothing spectacular about being away from his family or his surroundings in prison. Without a doubt Thomas’ INNOCENCE has already been revealed—that’s why it took a group of people with law degrees and professional certifications to violate laws in order to get him convicted. While the Campbell’s and their recruits breathe HATE—Thomas and his family breathe the notion that INJUSTICE IS NOT JUSTICE AT ALL!!!! Thomas and his family are NOT bitter—for Thomas and his family to be bitter—would say that LIARS are WINNERS. For Thomas and his family to be bitter—would say that ALL of God’s promises to Thomas’ mother—who spent many years literally going into her sons bedrooms and praying over them—were wasted (God’s promises are NEVER wasted). For Thomas and his family to be bitter—would definitely be EXTREME! FLORIDA CITIZENS BE AWARE—17-year-old DeShon Thomas was accompanied by his mother when they walked into the Leon County Sheriff’s Office on January 28, 2011. Neither Thomas nor his mother thought that a close friendship with then, Leon County Sheriff Larry Campbell and Sheriff Campbell’s son, Assistant State Attorney/Prosecutor Jack Campbell (Meggs’ Assistant Attorney), along with money, money, money– had privileged Don Odham, a non-employee of the Leon County Sheriff’s Office, to COMPLETELY RULE over veteran certified law enforcement officers. SERIOUSLY! Mr. Don Odham violated several of Thomas and his mother’s rights, including ignoring Thomas’ mother’s invocation of her minor son’s Miranda Rights and preventing Thomas access to an attorney. Other deputies stood by idle while this all occurred. The friendship and money provided to Leon County Sheriff Larry Campbell elevated Mr. Don Odham above all including the Sheriff’s Command Staff, which included current Leon County Sheriff Mike Wood and current Florida Department of Law Enforcement Commissioner Richard Swearingen’s brother, Robert Swearingen. Leon County Sheriff Mike Wood was appointed by Governor Rick Scott in January 2015–Leon County Sheriff Larry Campbell passed away in December 2014. In order to charge and convict Thomas in October 2013, based on “Pay to Play Cop—Don Odham”– ALL of the NUMEROUS hours of training of several teams of detectives, Crime Scene Unit, K-9 Unit, laboratory testing—all of these state certified law enforcement officers and agencies had to fall flat—making them look incompetent in their professions. In addition, there were legal documents notarized and filed with the Leon County Clerk of Courts identifying Mr. Don Odham as a Leon County Sheriff’s Detective—these documents contained FALSE information. While Mr. Don Odham did not wear a uniform, he had a badge and his own patrol car to take home. Mr. Don Odham was NEVER deposed in Thomas’ case, yet, Mr. Don Odham (alone) claimed to have obtained incriminating statements from a witness that led him (Mr. Don Odham) to prepare the Summary of Offense and Probable Cause, then he (Mr. Don Odham) provided the Probable Cause to Sheriff Campbell’s son, Assistant State Attorney Jack Campbell—charging Thomas with possession of drug paraphernalia, cultivation of marijuana, two counts of 1st degree murder, possession of a firearm by a juvenile delinquent, and then a year or so later—simultaneous to Thomas and his mother firing his private attorney—Thomas was charged with Solicitation to Commit 1st Degree Murder. Thomas, who was 17-years-old in 2011, was a full-time freshman at Tallahassee Community College and had been on his job at a local fast food restaurant for nearly a year. Because Mr. Don Odham was NEVER deposed, it would take nearly 3 years (during trial) for Thomas and his mother to learn that Mr. Don Odham has nothing more than IMPOSTER. While Mr. Don Odham had been spoken to the jury as “Detective Odham”, the truth of the matter was “Detective Odham” was IMPERSONATING A LAW ENFORCEMENT OFFICER under the protection of Sheriff Larry Campbell and others. And Circuit Judge Jackie Fulford was allowing State Prosecutor Jack Campbell and Thomas’ court appointed defense attorney, Conflict Counsel Daren Shippy, to LIE and MISLEAD the jurors. Convicting Thomas had taken nearly 3 years. Three years of CORRUPT JUDICIAL OFFICIALS—who WENT OVER & BEYOND to violate several of Thomas’ rights–including bullying him into pleading no contest to possession of a firearm by a juvenile delinquent. Because all involved knew that Thomas was CLEARLY INNOCENT! None of Thomas’ four court appointed attorneys set out to depose Mr. Don Odham. Thomas’ mother (single mother of four) paid defense attorney Greg Cummings nearly $30,000—Cummings refused to depose Mr. Don Odham and the witness who Mr. Don Odham claimed to had given him incriminating statements. Cummings failed to inform Thomas of Mr. Don Odham impersonating a law enforcement officer. Cummings refused to provide Thomas with both victims’ autopsy reports. After Thomas fired Mr. Cummings, Thomas was charged with solicitation to commit 1st degree murder and put in solitary confinement for over a year—where Thomas was unable to make phone calls (including to his home) and unable to have any visitors. When Thomas filed a Florida Bar complaint against Mr. Cummings for failure to disclose and other obvious violations of The Florida Bar rules, Thomas’ complaint fell flat. Before and during Thomas’ trial, veteran detectives did not support Mr. Don Odham accounts that led to Mr. Thomas’ charges. Apparently, those veteran detectives were aware that their credibility along with the TEAMS of other veteran law enforcement officers, agents with the Florida Department of Law Enforcement and the Federal Bureau of Investigation (Jacksonville) was nothing in comparison to Mr. Don Odham’s money and friendship with the father/son team. Leon County Sheriff Larry Campbell and his command staff charged the suspects and Sheriff Campbell’s son prosecuted them—ensuring their conviction by ordering the judge around—including having judges to sign-off on frivolous search warrants and probable cause affidavits containing false information. “Pay to Play Cop—Mr. Don Odham” versus PROTECTING THE COMMUNITY. Mr. Don Odham and his wife gave money to Leon County Sheriff Larry Campbell (Democrat), and Mr. Don Odham gave money to the Republican National Committee. Could this be why Thomas’ appeal is turning out to be as much of a joke and the circus leading up to and through his trial? If any political party truly wish to save tax payers money—then they should STOP selling out to IDIOTS! Tallahassee, FL—Dr. Anthony J. Clark with Florida’s District Two Medical Examiner’s office committed perjury during the double murder trial of DeShon Thomas. Thomas, who was 17-years-old, was charged as an adult in January 2011 double murder case in Tallahassee. 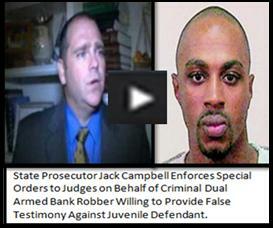 Dr. Clark’s perjured testimony helped State Prosecutor Jack Campbell secure the convictions against Thomas. State Prosecutor Jack Campbell’s dad, Leon County Sheriff Larry Campbell, was investigating the double murder case. There was no physical evidence linking Thomas to the double murders, therefore, the Campbell’s (father son duo) had recruited a family friend, Donald Odham, a non-employee of the Leon County Sheriff’s Office, to impersonate a certified Leon County Sheriff’s Detective to make their case against Thomas. Mr. Odham was assigned lead detective on the double murder case, replacing the acting lead detective and her team of detectives. In addition, there is notarized court documents filed with the Leon County Sheriff’s Office identifying Mr. Odham as a Leon County Sheriff’s Detective. And Mr. Odham was allowed to testify before a jury under false pretenses. Dr. Anthony Clark’s testimony in comparison to his original autopsy report of the victims is clearly contradicting in order to support the Campbell’s theory. In October 2013, Thomas was sentenced to Two Life Sentences plus 30 years. Recently, the family of Mr. Marlon Brown received information that a medical examiner, Dr. Shipping Bao, was ordered to change information on Mr. Brown’s autopsy report. Mr. Marlon Brown was rundown by a Deland Police officer’s patrol car and pin to a fence. Dr. Bao, states that he reported Mr. Brown’s cause of death as a homicide, but was ordered to change the cause of death to mechanical asphyxia, and that there was no evidence he (Mr. Brown) was struck by the police car. In the double murder case of DeShon Thomas, it is believed that Circuit Judge James C. Hankinson and Circuit Judge Jackie Fulford and Thomas’ court appointed attorneys were aware that Don Odham was not a Leon County Sheriff’s Detective, hence was the foundation of the nearly three years of judicial officials conspiring to secure Thomas’ convictions. State Prosecutor Jack Campbell refused to allow the District Two Medical Examiner’s Office to make the victims autopsy reports public record. Thomas’ defense attorneys refused to provide Thomas a copy of the autopsy reports. Thomas’ defense attorneys refused to provide Thomas’ mother with a copy of the victims autopsy reports—this prevented Thomas’ mother from seeking an opinion of an independent medical examiner. Early in the case, Thomas’ mother paid private defense attorney, Greg Cummings, nearly $30,000 to represent 17-year-old Thomas. Mr. Cummings promise Thomas and his mother to provide them with the victims’ autopsy reports. After being on Thomas’ case for nearly two years, Cummings never provided Thomas with anything—not even the victims’ autopsy reports. A medical examiner being ordered to commit perjury or change autopsy reports to support or protect the State of Florida is a crime. It and a harsh deception to victims, defendants and the citizens in the community by all government officials directly and indirectly involved. Tallahassee, FL—ONE HUNDRED FIFTY PEOPLE MURDERED! 150 babies murdered! 150 sons and daughters murdered! 150 dreams dead! Babies who did not walk or talk—murdered! Young teenagers who possibly had not gone out on their first date—murdered! Husbands lost their wives. Wives lost their husbands. Sons and daughters lost their mothers and fathers. ALL MURDERED! It’s been reported that one of the black boxes from Flight 9525 recorded the screams and crying of the passengers aboard Germanwings, as co-pilot Andreas Lubitz–DELIBERATELY PLOUGHED—the passenger plane into the French Alps on March 25, 2015—MURDERING ALL ONE HUNDRED FIFTY PASSENGERS. Was Germanwings co-pilot Andreas Lubitz suicidal? Some media outlets have reported—YES, ANDREAS LUBITZ WAS SUICIDAL. Who knew that Andreas Lubitz was suicidal? Some media outlets have reported of all important sources—GERMANWINGS–WAS AWARE OF ANDREAS LUBITZ HAVING BATTLED DEPRESSION FOR SIX YEARS PRIOR TO COMMITTING SUICIDE AND 150 MURDERS. ONE HUNDRED FIFTY LIVES LOST IN AN INSTANCE. OVER ONE HUNDRED FIFTY FAMILIES LIVES FOREVER ASSOCIATED WITH GERMANWINGS FOREVER—AN ENTIRE INVASION! Not at once. But over TOO MANY YEARS—PEOPLES LIVES HAVE BEEN STOLEN! Not at once—but over TOO MANY YEARS—PEOPLES LIVES HAVE BEEN STOLEN! More than 150 LIVES—BUT 1 STOLEN LIFE IS TOO MANY! HOW MANY INNOCENT PEOPLE ARE IN FLORIDA’S PRISON SYSTEM FACING LIFE SENTENCES? How many defendants screamed at the reading of the guilty verdict? How many parents yelled and reached out to their INNOCENT CHILD/ADULT-CHILD? How many kids cried for their INNOCENT parents as they were being led out of the courtroom? Unfortunately, there is no blackbox to record such a TRAGIC MISCARRIAGE OF JUSTICE! Who knew that the DEFENDANTS were INNOCENT? The detectives, the state prosecutors, the defense attorney, the judges, the medical examiners, the witnesses… Who DECEIVED the community that they ARE supposed to PROTECT? Who DISHONORED A SWORN OATH? Who bare FALSE WITNESS? MORE THAN 150 LIVES—BUT 1 STOLEN LIFE IS TOO MANY! INNOCENT PEOPLE IN FLORIDA’S PRISON SYSTEM IS A TOTAL INVASION ON THE LIVES OF THE VICTIMS FAMILIES, INNOCENT INMATES AND THEIR FAMILIES! On March 25, 2015, Andreas Lubitz was the only person whose life was fulfilled—his plan as a child to be a pilot—his dream to pilot a commercial jet—his plan to commit suicide in the manner in which he chose. Over the years, so many lives and dreams have been cut short by Florida’s corrupt judicial system—not because of what a person may have done—but what those within the EVIL BLOODLINE—***Gregory Cummings? Jack Campbell? Larry Campbell? Willie Meggs? James Hankinson? Jackie Fulford? Donald Odham? Daren Shippy? Dr. Anthony Clark? Eric Trombley? Georgia Cappleman? ??????????? ?